Employee Training and Development 6 Edition Raymond Noe's Employee Training and Development sets the standard in this course area. First introduced in 1998, ETD became the market-defining text within 6 months of publication. 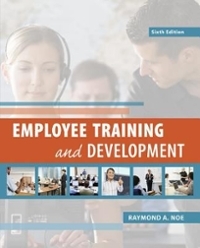 Its popularity is due to its lively writing style and relevant examples of the most up-to-date developments in training, research and practice, including the strategic role of training and the use of new technologies in training.Employee Training and Development 6th edition strikes a balance between research and real company practices. It provides students with a solid background in the fundamentals of training and development such as needs assessment, transfer of training, learning environment design, methods, and evaluation. To help students better understand the relationship between the main elements of the book, the book is now organized into five different parts. Part I focuses on the context for training and development and includes a chapter devoted to strategic training. Part II includes coverage related to the fundamentals of designing training programs. Chapters in Part II focus on needs assessment, learning theories and program design, transfer of training, and training evaluation. Part III focuses on training and development methods and includes chapters devoted to traditional training methods, e-learning and the use of technology in training, employee development, and special issues in employee development, such as managing diversity, succession planning, and cross-cultural preparation. Chapters in Part IV cover career issues and how companies manage careers, as well as challenges in career management, such as dealing with work-life conflict, retirement, and socialization. Finally, Part V provides a look at the future of training and development.